FOUND - CUDDLE ZONE BIG NOSE WHITE LAMB Please Help This Family!! Home→FOUND→FOUND – CUDDLE ZONE BIG NOSE WHITE LAMB Please Help This Family!! FOUND – CUDDLE ZONE BIG NOSE WHITE LAMB Please Help This Family!! My mom received the lamb I believe this past weekend and we are visiting them this weekend and I got it =) It is the same exact one!!! I am sooo thankful to have it! I appreciate it so very much, it really means a lot to me! I hope you have a terrific weekend! God bless! Hi! I was so happy to find your website. 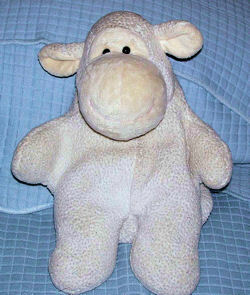 I was wondering if anyone could possibly help me find a very special stuffed lamb. He is very special to me because my husband and I bought this when I was pregnant…unfortunately our baby passed away when he was just 5 days old, and his lamby was buried with him. I would really like one like it for me to have kind of in remembrance…I’ve looked all over at Targets and eBay and can’t seem to find him. They still have Cuddle Zone at Target but they changed the types of animals. I appreciate any help I receive in how I could find one like him!!! If you can help Julie find this roley poley Cuddlezone big nose lamb, THIS SITE IS NO LONGER ACTIVELY MANAGED. Please use Our FREE FACEBOOK GROUP, including #042008-1 in the subject, . Thank you so much for the information. I tried several different search combinations, but never could find the name of the company that made these. I will bookmark this site, as I am sure I will need it again. If it’s Commonwealth, I suspect the lamb came from Wal-Mart, if that helps anyone. And thank you for the compliment on on our site. I work hard on the computer side of it, and hubby goes searching during the week, plus we always go out on our Friday Date Day looking for lovies. Glad you found a replacement for your “flushed lovie.” The trick is to make the replacement as “good as old,” as one Mama suggested. I wrote the company, too, but not the Customer Service Dept. Hopefully, one of us will be successful. I am so sorry, but this is not our toy. I tried asking a few friends in the toy industry but can not determine who the manufacturer is. My only other suggestion is for you to contact Target Stores headquarters in Minneapolis and see if the toy buyer can help you. Best of luck in finding this toy for the grieving family!!!! I’ll try her suggestion to contact the Target toy buyer in Minneapolis. We have found only a few toy companies who will make any effort at all to help find these very important lovies, so I would like to give COMMONWEALTH TOYS an A+ for effort! I’ve written to the Korean manufacturer, Soyea. The Dongguan reference means is was made at their factory in China. They have a very nice website, so I’m hoping they will be able to help. I am looking for the same stuffed animal, but a big nose COW from Cuddle Zone. He was purchased sometime in October-ish of 2006 at Target. If you find your lamb, could you forward the information to me so I can find my cow? Thanks! Jessica you have to make your Profile on Blogger public for people to be able to email you directly. I apologize in advance if this is asking for help rather than giving help, but I noticed that Dirty Butter said she wrote to Soyea with the hope they could help. I wondered whether they replied to you because I have been trying to contact them for at least the past six months via e-mails and even faxes, in South Korea and in Hong-Kong, to enquire about their plush toys, but have had no reply whatsoever. I wondered whether you could let me have the address you wrote to (if they have replied to you). This would be a fantastic help. I’m sorry BusyBee, but they never answered me, either. Thank you so much for such a prompt reply Dirty Butter. I am sorry to hear that you haven’t been able to get any reply from them either. I am trying yet a new contact today. Would you like to hear if I can get hold of them?